The sustainable development agenda demands new approaches to knowledge and skills development for all actors. Development progress requires holistic thinking, moving beyond separate mandates and structures and exploring linkages between different thematic issues. The 2030 Agenda requires new partnerships to identify key problems and opportunities, leveraging diverse means of implementation, and facilitating joint action to ensure progress and maximise results. In this context, life-long learning must be seen as a key component of personal as well as organisational development. To address the requirements of the 2030 Agenda, the United Nations System Staff Knowledge Centre for Sustainable Development (UNSSC KCSD) integrates knowledge across UN agency mandates and thematic pillars of sustainable development. The UNSSC KCSD fosters inter-agency coherence and strengthens dialogue and networks within and beyond the UN system. It is committed to facilitating catalytic learning across the UN system and beyond in support of sustainable development results. Through its work, the UNSSC KCSD contributes to enhancing coherence of development interventions and increasing operational and conceptual capacity of UN staff as well as a multitude of other partners. EXAMINE: We provide concrete learning opportunities where UN Staff and partners can learn and examine the sustainable development agenda. EMPOWER: We assist UN Country Teams in their efforts to implement the 2030 Agenda by identifying their learning needs and providing customised learning programmes. PARTNER: We help the UN and partners to better engage in constructive partnerships to become genuine catalysts for sustainable development. MEASURE: We recognise the importance of a coherent measurement language in the pursuit of the 2030 Agenda, which is reflected in our learning offerings. LEAD: We create space where leaders across sectors can hone their craft, becoming more effective, strategic collaborative facilitators, implementers and leaders of transformational change. COMMUNICATE: We facilitate learning on effective communication and advocacy for sustainable development and engage alumni and the larger community in continuous discussions through diverse knowledge management platforms and training formats. UNSSC Knowledge Centre for Sustainable Development’s learning approach in the context of the 2030 Agenda for sustainable development promotes a comprehensive understanding of substantive aspects of the 2030 Agenda and its sustainable development goals and raises a stronger awareness of structures and dynamics that influence the rapidly changing world. More importantly, UNSSC KCSD’s learning approach recognises the importance of focusing on the 2030 Agenda learner and to adapt learning methodologies to their needs and potential to truly contribute to the achievement of sustainable development. Decisions, initiatives, and new processes do not guarantee a shift in culture unless behaviours are changed. Traditional approaches to learning that focus on one-way transmission of information fail to achieve this. A change in behaviour can be brought about through effective learning design that focuses on the overall learning experience. 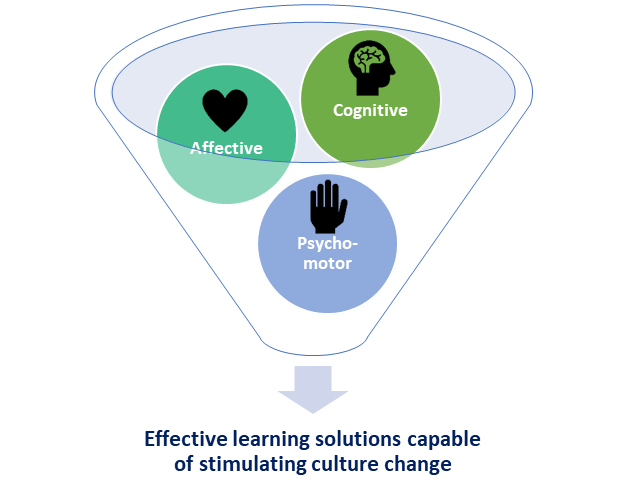 Effective learning solutions are those that successfully target the three drivers of culture change: motivation, knowledge, and skills. 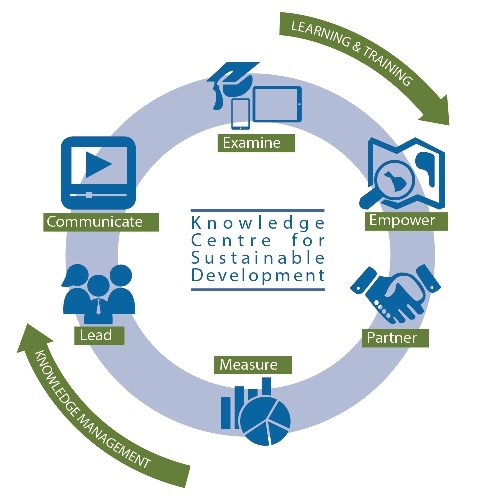 UNSSC Knowledge Centre for Sustainable Development’s effective learning solutions are designed from the get-go with the end user in mind, as opposed to a variety of cookie-cutter learning programmes, which are usually retro-fitted to the learner. With the aim of stimulating culture change, UNSSC KCSD employs a distinct sustainable development learning methodology that effectively combines cognitive, affective and psychomotor elements in its learning design. Such learning focuses not only on what the learner needs to know (cognitive element), but also on equipping them with the relevant skills that allow them to put the knowledge to use (psychomotor element), as well as influencing the learner’s motivation or making them question their values and belief system (affective element). To this end, UNSSC KCSD’s learning design is interactive, highly-facilitated, reflective and experiential. Experiential learning that efficiently combines the use of real-life case studies, excursions, role plays, application-oriented projects, as well as reflection exercises to render the notion of sustainable development thinking more tangible, prompts meaningful application of the concepts learned and allows learner engagement on all three levels: cognitive, affective and psychomotor.